I was planning to eat avocado vegetable hash for my late summer home breakfasts, but for about a week or two actual summer came back like blazes and it was too hot to turn on the oven. 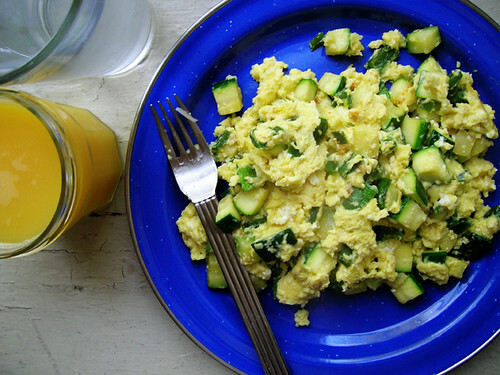 And I had come across these zucchini scramble breakfast tacos but I don't eat starch for breakfast and anyway am not organized enough to organize tacos for breakfast, but could definitely dig into that zucchini scramble on a plate. So that's what I did. Melt the butter with the olive oil in a skillet over low heat while you dice the jalapeno. Toss the diced jalapeno in the butter, turn up the heat to medium low, and let that soften while you dice the zucchini. Toss the diced zucchini into the jalapeno, turn up the heat to medium, push it around a bit with a heatproof rubber spatula but otherwise "let it work," as Rachael Ray says. The point of all this is to gently cook the veggies so they're tender—not raw-crunchy and not browned-crunchy—so they melt nicely, texture-wise, into the scrambled eggs. Now actually is a good time to do a few dishes, so you don't bother the veggies too much while they do their thing. Beat the eggs and pour them over the softened veggies, and shake a little grated parmesan over the eggs. Push everything around with your rubber spatula until the eggs are scrambled and cooked, maybe a little longer so the scramble isn't watery but still moist. I said it, MOIST. And that's it, scrape onto a plate and eat! It is a plate of awesome.